Believe it or not, the Do Not Enter Sign did not exist on freeway on ramps on the nation’s first freeways. Numerous head on collisions on the freeway on ramps and other divided highways led to the development of the R5-1 Do Not Enter and the R5-1a Wrong Way signs. The FHWA list these signs as selective inclusion signs and their placement are important. 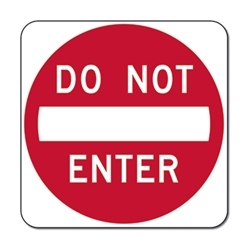 The DO NOT ENTER sign, if used, should be placed directly in view of a road user at the point where a road user could wrongly enter a divided highway, one-way roadway, or ramp. The sign should be mounted on the right-hand side of the roadway, facing traffic that might enter the roadway or ramp in the wrong direction. If the DO NOT ENTER sign would be visible to traffic to which it does not apply, the sign should be turned away from, or shielded from, the view of that traffic. The above guidance should be followed by private property owners’ especially high volume parking lots. In the case of private property signage, it does not have to be same size as road 36” R5-1 signs. Typically, a 24” or 18” R5-1 can be used, but it is recommended, since it is a vital regulatory sign, to use a High Intensity Prismatic reflective sheeting sign.